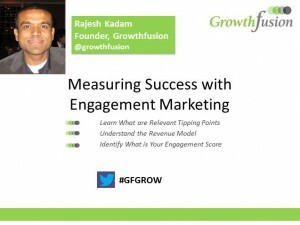 Join Rajesh Kadam, Founder of Growth Fusion in a discussion about Engagement Marketing. Rajesh will share specific results from an early stage venture company providing cloud-based services for web publishers. You will learn what are the relevant tipping points for identifying demand gen success. Also included will be a review of the Revenue Model, which will help you to identify what your engagement score is or ought to be. Lead nurturing helps lower your cost per lead (CPL), create consistent, constant, and relevant communication with potential customers throughout the various buying stages and build multi-step marketing programs that build relationships with qualified leads over time. It is a proven method allowing a company to better draw prospects in, accelerate the buying process, and convert more leads into sales. 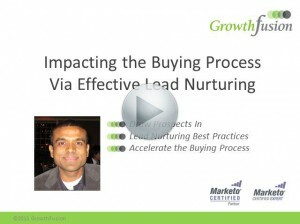 Growth Fusion CEO and Marketo Expert Rajesh Kadam speaks on the specific benefits of lead nurturing campaign and the benefits it offers any company. Marketo interviewed Growth Fusion’s CEO Rajesh Kadam to understand the demand generation and revenue strategies he is employing at his client Simply Hired.